This non-magnetic fixed MRI Bariatric Stretcher boasts a generous 600 lb weight capacity and convenient 22" x 31" storage tray below. Comes standard with four locking casters, grounding chain, stretcher pad is covered with Medical Grade Sure-Check Fusion III material. Fowler back head rest adjusts from 0 to 75 degrees. Non-marring bumper protects on all sides. Flip down side rails provide easy accessibility. 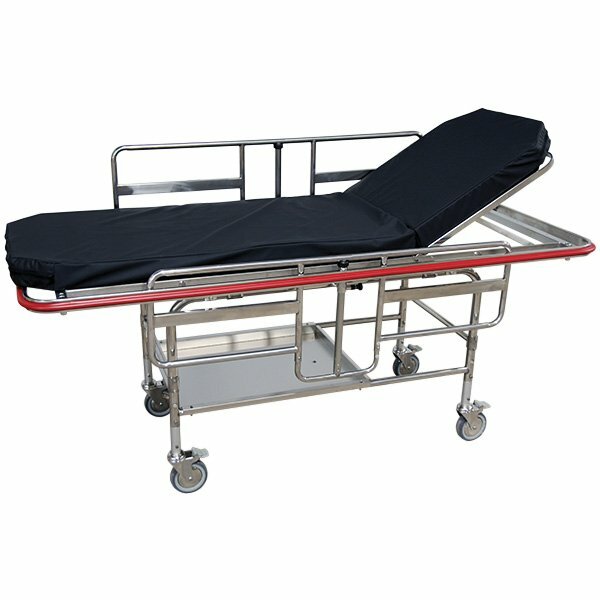 This non-magnetic MRI bariatric gurney is constructed entirely of non-ferrous materials. Specifically designed for use in and around the MRI suite. All materials including fasteners and bearings are either non-ferrous metals or special polymers. Height with Rails up 42"